In most Bible translations these words are written in red, meaning they are the words of Jesus Christ. The teaching is part of Christ's famous Sermon on the Mount. Contrary to what you might hear in many American churches today, the way that leads to eternal life is a difficult, less-traveled path. Yes, there are blessings along the way, but there are many hardships, too. "You can enter God’s Kingdom only through the narrow gate. The highway to hell is broad, and its gate is wide for the many who choose that way. But the gateway to life is very narrow and the road is difficult, and only a few ever find it." One of the most common misconceptions of new believers is thinking that the Christian life is easy, and God solves all of our problems. If that were true, wouldn't the path into heaven be wide? Christ's teaching about the narrow gate is meant to be practical, not dogmatic. Many scholars believe it would be a mistake to think Jesus was implying that God has destined the majority of people for hell. Those who find the narrow gate must search for it deliberately because it isn't obvious or easy to find. The broad path, on the other hand, is the popular route. But, no matter how many people we observe choosing the broad road, it is vital that we stick to the narrow one. Our steps along the narrow road may be lonely. The initial step involves a drastic reversal of everything we have known in life. From there forward, the path includes a daily surrender of our natural self-centered tendencies. It's no wonder the road is less traveled. One of the early church's greatest preachers, John Chrysostom (349-407) said, "The narrow path is unattractive by nature but becomes easy when we choose to follow it, because of our hope for the future." 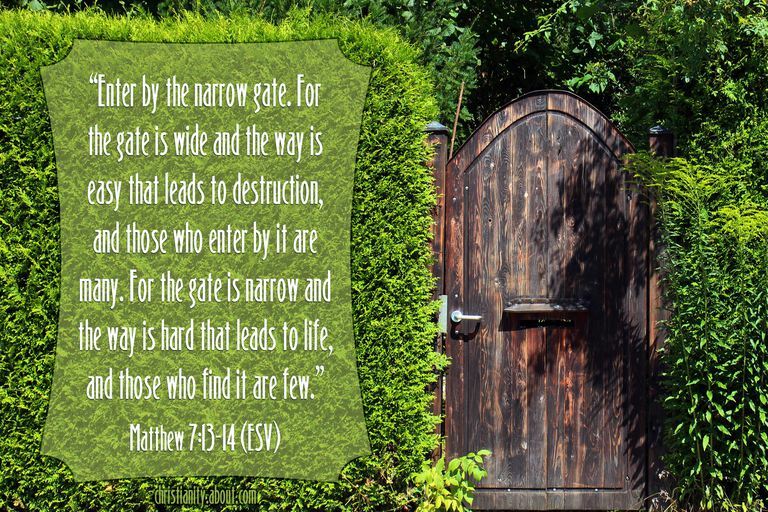 The narrow gate is the raw reality of a daily walk with Christ. It is what the Pharisees missed and we can miss, too, if we don't surrender to the Lord's way. Like the Pharisees, we tend to prefer the wide path. This road is paved with independence, self-righteousness, and the typical inclination toward choosing our own way. Taking up our cross means denying selfish desires. The genuine servant of God will almost always be in the minority. Caesarius of Arles (470-543), another early church father said, "Labor is not long on the narrow road, nor is joy lengthy on the broad one. Those whom the broad way of wickedness delights, after brief joy will have endless punishment. Those who follow Christ on the narrow way, after brief tribulations will merit to reach eternal rewards." Only the road less traveled leads to eternal life.